Omega-3 fatty acids from fish oils have anti-inflammatory and antithrombotic effects, because they compete with arachidonic acid in the cyclooxygenase and lipoxygenase pathways. Fish oils inhibit the arachidonic acid synthesis of thromboxane A2, which causes platelet aggregation and vasoconstriction. Fish oils can also cause increased production of prostacyclin, a prostaglandin that causes vasoconstriction and reduces platelet aggregation. Omega-3 fatty acids seem to suppress COX-2 expression and the inflammatory cytokines interleukin (IL)-1 alpha and tumor necrosis factor (TNF)-alpha. Fish oils are used for cardiovascular conditions, including stroke and heart disease, due to anti-inflammatory and antithrombotic effects. Fish oils decrease blood viscosity and increase red blood cell deformability. Consumption of one to two servings per week of fish oils from dietary sources appears to reduce the risk of coronary heart disease death by 25%. 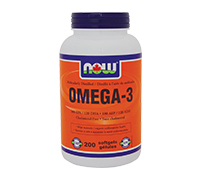 NOWÂ® offers great value in these premium quality, molecularly distilled fish oil supplements. Directions: Adult Dosage: Take 2 softgels, 1-3 times daily with meals.